Do you prefer one-on-one learning to a traditional classroom setting? If so, consider a Writers’ Program Consultation in Creative Writing or Screenwriting. 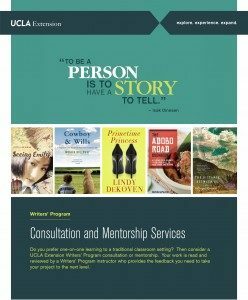 For a consultation in either Creative Writing or Screenwriting, you may request a specific Writers’ Program instructor with whom you would like to work or an advisor can recommend one for you. Once an instructor is agreed upon, he or she carefully reads and reviews your work and sends you a written evaluation. Arrangements are then made for a follow-up conversation in person, via phone, or by web chat (to be determined by the instructor). For formatting guidelines and fees, or for information about the differences between consultations and mentorships, click here. You can also call us at (310) 825-9415.